This is a high exposure event attended by a multitude of college and professional scouts. This event sells out every year, last year we were sold out by June 1st, so we recommend registering as soon as possible. Since its inception in 2005, the Prep Baseball Report has evolved into one of the country’s biggest and most respected independent scouting services, with a singular focus of providing comprehensive coverage in every state. More than 450 colleges and pro scouts subscribe to the Prep Baseball Report services. 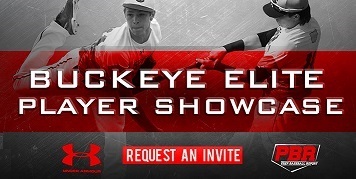 All players that participate in the Buckeye Elite Showcase will receive an online profile with their verified statistics, scouting report, picture and video. Additionally, all subsequent stories written about a prospect will be linked to the player’s profile, ultimately creating a one-stop shop for recruiters. We would like to welcome you and your team to the 14th annual Buckeye Elite Showcase Tournament. The 2019 event will be held throughout Central Ohio from July 11th through the 14th. The Buckeye Elite Showcase Tournament is one of the largest baseball tournaments in the country. There are going to be 96 U18 teams, 80 U16 teams, 80 U15 teams and 48 U14 teams. The tournament’s field will be one of the most competitive in the Midwest. In attendance will be teams from over 15 states as well as Canada. In addition to the highly competitive play, games will be held on over 55 of central Ohio’s premier high school fields and 8 college fields, making it one of the most prestigious and highly scouted baseball events in the Midwest. *There are no consolation games!